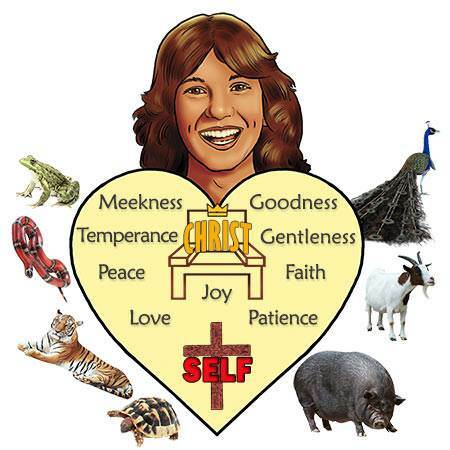 Christ or Self? 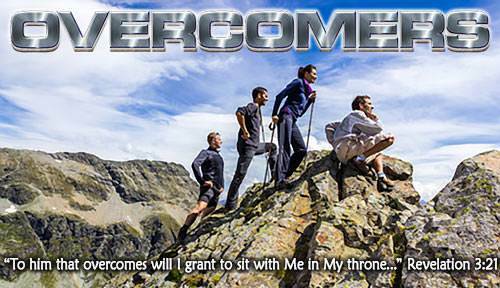 Lesson 9 in "Overcomers"
After becoming a Christian, sooner or later I make a shocking discovery. I discover that sin is still with me. I have an enemy in me called "the flesh." The flesh is very sinful. The main characteristic of SELF is rebellion against God. SELF says, "I will do what I want to do!" Where did we get this spirit of rebellion? We got it from Adam. Where did Adam get it? He got it from Satan! Satan was the first rebel. 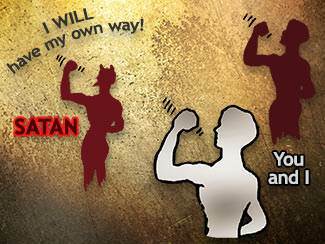 Satan said in his heart, "I will have my own way!" Then Adam rebelled against God and said in his heart, "I will have my own way!" Now you and I say in our heart, "I will have my own way!" By nature we are all like this. The Bible says, "…we have turned every one to his own way…" (Isaiah 53:6). When I was saved I became a new person in Christ, but I did not get a new body. I still have the same body I had when I was unsaved, and I still have the sin nature which goes with that old body. But the good news is that God does not count this sin nature against me. Only when I do what my sin nature wants me to do does it become sin. What happened when I took Christ as my Savior? "I don't have to obey you!" "I want to do it my way!" "I don't care what God says; I will do what I want to do!" When I was saved, another Person came to live in my heart. The Lord Jesus Himself came to live in me. I was so happy. I thought my life would always be happy and peaceful. I thought I would always want to please God and obey Him. But I soon discovered that SELF wants to continue ruling in my heart. Christ has the right to rule, but SELF still tries to rule me. I must choose whether I will be ruled by Christ or SELF. What happens when SELF rules in my heart? When SELF is on the throne of my heart, I will live the self-life. I will have many sins in my life. Let us think about some of these sins. Are you ever proud? Do you think mean or unkind thoughts of other people? Do you think, "I'm better than that person"? Do you think, "I should have first place"? This is the sin of pride. Let us use a peacock to represent this sin. 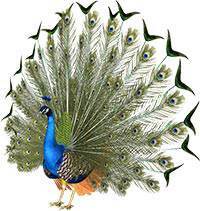 As you know, the peacock is a very proud bird, always strutting around and showing off. Are you ever selfish? Do you ever say, "That's mine! I'm not going to share it with you." Do you want the best and the most for yourself? 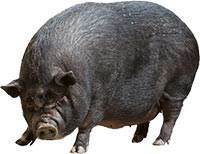 Let us use a hog to represent the sin of selfishness. Do you ever say bad things or talk ugly? Do you tell or listen to dirty stories? Do you gossip—say bad things about other people? The Bible says, "Let no corrupt communication [no bad talk] come out of your mouth." Let us use this ugly frog to represent the sin of bad talk. Do you tell lies? Jesus said that Satan is "the father of lies." This means that all lies come from him. When we tell a lie, we are acting like Satan. Satan used a serpent to deceive Eve and persuade her to disobey God. He uses lies to get us to do wrong things. In the Bible Satan is called "that great serpent," so let us use a snake to represent the sin of telling lies. Do you ever get angry with someone and want to hurt them? Do you want to "get back" at those who have hurt you? This is a form of anger called "revenge," and God hates it. Do you lose your temper and say mean and hateful things to others? Let us use this tiger to represent the sin of anger. Do you ever get into trouble because you do things that you know you should not do? Perhaps your parents or your teacher tell you not to do something, but you go ahead and do it anyway. This is the sin of rebellion. Let us use a goat to represent this sin. Do you ever fuss and complain when you are told to do a certain job? Maybe your mother wants you to wash the dishes or your father asks you to do something around the house. You fuss and complain and drag it out, doing it very slowly. We will use this slow turtle to represent this sin of complaining. SELF is my biggest problem! When I allow SELF to be on the throne of my heart, I have these terrible sins we have been talking about. I am living the self-life instead of the Christ-life. 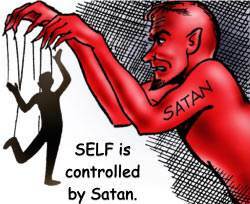 Whether we realize it or not, SELF is controlled by Satan. Many people are truly saved; they have taken the Lord Jesus as their Savior. But they are not happy. Why are they not happy? They are not happy because they are allowing SELF to rule in their lives. No child of God can ever be happy living the self-life. We can be truly happy only when we are living the Christ-life. As long as I am in my body, I can never get completely rid of SELF, but I don't have to be ruled by SELF. Let us see the steps in getting SELF off the throne of our heart. I see what God has done with SELF. SELF is not only my enemy, but it is also God's enemy. 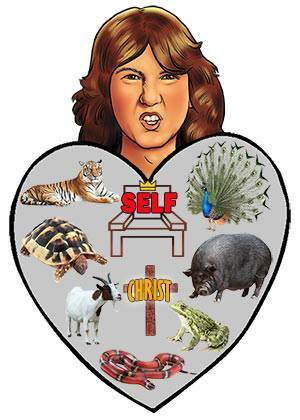 SELF hates God and will not obey God. How did God deal with SELF? The Bible says that God "condemned sin in the flesh" (Romans 8:3). What does this mean? It means that God put sinful SELF on the cross. God says there is only one place for SELF and that is on the cross, crucified. I choose to put SELF on the cross. What does God want me to do? God wants me to agree with Him that SELF shall be put on the cross and kept there. I say to SELF, "You shall not rule over me! I agree with God that your place is on the cross, crucified." I choose to make Christ King. What is the Christ-life like? How does this work out in my life? Let us say that I am doing something that I want to do, but my mother asks me to do something for her. What would SELF do? SELF would grumble and complain. What do I do? I say "no" to SELF and "yes" to the Lord Jesus. I obey my mother without grumbling and complaining. Somebody says something mean to me. What would SELF do? SELF would get angry and say something mean back to that person. But I am to say "no" to SELF and let Christ be King in my heart. What do I do? I smile at them and say a kind word to them. • God does not count my sinful nature against me. God says, "I count that as belonging to your old life. In My sight your old life ended with your death with Christ. I always see you as a new person in Christ." • Temptation is not sin. The Lord Jesus was tempted with terrible temptations by Satan, but He never sinned. I sin only when I give in to temptation. You say, "But sometimes I have really bad thoughts!" Every child of God has terrible thoughts at times, but they do not come from our new life. Satan has the power to put terrible thoughts into our minds. He tries to make us think that these are our thoughts, but they are not. We can say to him, "Satan, you are a liar! These are your thoughts, not mine, and I refuse them!" God knows the battle I have with SELF and with the devil, but God is for me! David said, "When I cry unto You, then shall my enemies turn back: this I know, for God is for me" (Psalm 56:9). I have an enemy within me that belongs to my old life, not my new life. SELF never dies, but God has "nailed" SELF to the cross. God wants me to agree with Him that SELF shall be kept on the cross and that Christ shall have His rightful place as King of my life. "Dear Father, I believe that You have done the right thing by crucifying SELF. I agree with You that SELF must be crucified in my life. Lord Jesus, You are the One who has the right to rule in my life. I want You to reign as King in my life. By my choice and by my will, I make you King of my life forever!"